The daughter of songwriter Burt Bacharach and actress Angie Dickinson, has committed suicide, a family statement said. Nikki Bacharach, 40, the couple's only child, who suffered from Asperger's Syndrome, died at home in California, spokeswoman Linda Dozoretz confirmed. Her family said she died "quietly and peacefully" to "escape the ravages to her brain" brought on by the autism. The Ventura County Coroner's Office said she had suffocated herself. 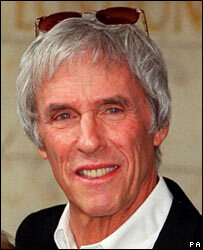 Miss Bacharach was born prematurely in 1966. Her family said she loved "kitties, and earthquakes, glacial calving, meteor showers, science, blue skies and sunsets, and Tahiti." She studied geology at Cal Lutheran University but was unable to pursue a career in the field due to poor eyesight. Her parents Bacharach, 77, and Dickinson, 75, were married from 1965 to 1981. The Oscar-winning composer, best known for Raindrops Keep Falling on My Head and What the World Needs Now is Love, has three other children from a previous marriage. Dickinson starred in the film Dressed to Kill and the TV show Police Woman.